The Oregon Solar Energy Industries Association (OSEIA) will host the Oregon Solar Energy Conference at the Portland Crowne Plaza from May 7 – 9, 2019. You can register online today and registration for OSEC is eligible for up to 50% matching Business Development Funds. This regional conference provides three days of training on business development, sales, installation and electrical code changes, solar plus storage, large-scale solar development and state policy topics. Join Energy Trust again this year on the first day of the conference for Solar Contractor Day where we will present technical training for installers as well as interactive presentations on the future of the solar business in Oregon. 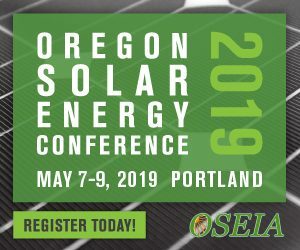 OSEIA members, non-profits, and students may be eligible for a discount to the Oregon Solar Energy Conference, email Erin Trimble for more information. As part of this year’s Energy Trust Solar Contractor Day business development track, Solar Program staff will provide a sneak peek into strategic planning process that the program has been going through, share the anticipated impact to trade ally businesses over the coming years, and collect feedback from attendees on key incentive program concepts. Register for Tuesday’s Solar Contractor Day as part of your OSEC registration. OSEIA will be holding Oregon’s first ever Solar Career Fair following Solar Contractor Day on May 7 from 3pm – 6pm. The event will provide students and interested job seekers examples of solar jobs they can pursue and will connect solar trade ally contractors with organizations that can help them find eligible applicants. For more information or if you are interested in participating in OSEIA’s Solar Career Fair, contact Meghan Craig.